No matter if its a funeral for a close relative or a friend of a friend, funerals are not the easiest thing to attend and neither is writing a thoughtful message to the family. Allow us to help by giving you many suggestions of messages and phrases that you would want to receive if things were reversed. It is unfortunate that we all must part ways before we meet again. But the great news is, we will all meet again someday! We send our condolences to you and your family for the loss of someone who has touched so many wonderful lives. My condolences on this hard day that's upon us, a time we have to say goodbye. But never forget we are only really saying, see you later. I do wish things could have turned out differently for you and your family. But knowing that ____ is at peace does give me some comfort. I hope you also can find comfort in knowing this. Condolences on your loss. Saying goodbye has got to be the hardest thing to do in this world. But at least we know its not forever. We will meet again soon. Sending our deepest condolences. In times like these I always find it difficult to express my condolences in a meaningful phrase. At the same time, I realize what I say really doesn't make much of a difference. Being there for you does. So please allow me to be there for you, in any way that I can. I can only hope my presence brings you comfort. Lost from this lifetime, but not lost forever. Our hearts are full of wonderful memories that would keep anyone alive for years to come. Please accept our condolences for your loss. Sending you our condolences. The imprint ____ has left on our hearts just shows his/her memory will never fade. I never know what to say in times like these. It then hit me, I need not say anything at all. What is important is that you know I am here for you if you need me. For anything. My condolences. 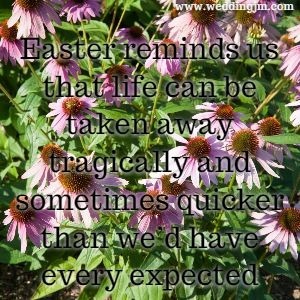 Condolences on your loss, which is not an easy one. But know that the place ______ now resides is a much better place than here. Let that give you comfort. I wish I had the exact words that would take all your pain away, but I don't. Hopefully knowing that there are people in your life that wish they could do the impossible to remove your pain is a comfort, if nothing else. Our deepest condolences. This is a sad day for many people. Condolences to all. But knowing that ______ is in heaven givens me some comfort. I just hope you also feel this comfort. We are so very sorry for your loss. Sending you our sincere condolences. A loss like yours is something no one should have to live through. Please know that we are all here for you and want to do anything we can to help you through this trying time. This is a time to be surrounded by those that love you, allow us to be here for you during this strenuous time and please accept our condolences. At this time I would like to express my deepest condolences. May God be with you in this time of sorrow. Sending all of our love to you and your family. Please accept our condolences. Saying goodbye is never easy to do, but what is easy is to tell you how loved you are, and how incredibly happy we are that you are here for us to tell you how much we love you. With loving condolences. A sad day is upon us, and letting go is one of the hardest things we have to do in our lives. But knowing _______ is in a place free from hurt and pain makes letting go a little bit easier. Please accept our deepest condolences. May I express our families sincerely condolences in the loss of your ______. He will be greatly missed and not just my family. He was a big part of many peoples lives. The love and kindness that ______ shared with so many people during her time on earth with us is something that will not be forgotten. Her body may not roam the streets anymore but her spirit will always be with us and you. Sending condolences and a whole lot of love your way. Many condolences on the loss of someone so dear to so many of us. Please remember they are in a much better place now and let that be your comfort. Our heart weigh very heavily on this day of mourning. And we cannot express enough condolences for your loss. If there is anything that we can do for you, please let us know. This community will feel this great loss. If we pull together, we can all lean on each other for support. Please allow your community to be there for you and know that every condolence phrase you hear comes straight from the heart. I am very sorry for your loss and everything this means for you and your family. You have a strong and loving family who will help you through this trying time, but remember, you have friends too who want to be there for you as well. So every time you hear someone give their condolences, please know that it is more than words they are giving, there is a ton of love being sent as well. You lost someone you love, and we all send loving condolences to you. But please, don't push us away, we don't want to lose someone we love too. Loss of this magnitude would seem catastrophic to just about anyone. We see what you are going through and aren't really sure what we can do to help and send our loving condolences. But keep in mind, we are here, we will not leave you. 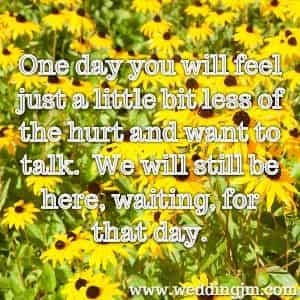 One day you will feel just a little bit less of the hurt and want to talk. We will still be here, waiting, for that day. The hurt you are feeling today may seem incurable. And you are probably right. But each week, each month, each year, the hurt will fade. 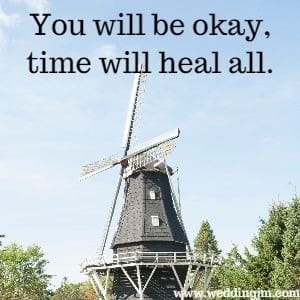 You will then start to feel yourself again, and at that time you will appreciate all the loving words of condolence that may seem overwhelming on this particular day. We love you so much. At a time like this, we figured that is all you need to hear. So please, allow this condolence phrase to find it's way to your heart. We are so sorry you are having to go through such a horrible ordeal. We wish there was some magic spell we could do to relieve you of this pain verses having to send condolence phrases in a card. Whenever, however, with whoever you feel most comfortable with, talk, cry and allow yourself to grieve. I never thought this day would come. 'He'll live forever', we use to say. But I suppose that is not true. Not on this earth anyway. But up in Heaven, he is living! He is happy, he is calm and he is with God. Please allow this condolence message to bring you a happy thought. We wish we could be right beside you, holding your hand while you deal with such a devastation. Please know our thoughts and prayers are with you. You will move past this, you will be happy again and one day you will look back at all the condolences you received and realize how many people cared for you and your lost loved one. Please accept our love and condolences. She was a great woman. No one will ever fill her shoes. The memories will be everlasting. May you always remember that love. And remember one thing if nothing else, you are never alone, the number of condolences you've received in these past few days prove that! There is simply not enough words to tell you how sorry I am for your loss. He/she was a good man and will be dearly missed. This loss is so unfortunate and nobody should have to endure the pain you and your family are going through. 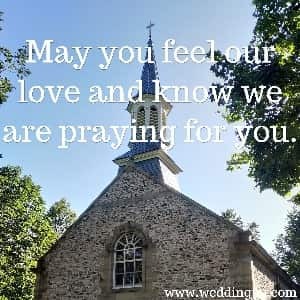 May you feel our love and know we are praying for you. I can�t even imagine what you are going through. But please know that I am here for you. Even if its just to talk, I am a good listener. We hope you know that you are not alone in this. There are many people who cared for __________ and will miss him/her so much. They are all wanting to be there for you to help support you through this traumatic event. Our thoughts and prayers are with you during this tough time. 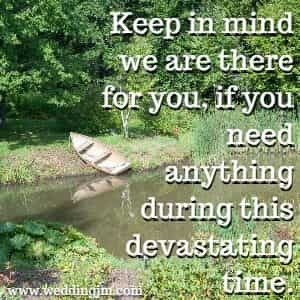 Please keep in mind we are here for you if you need us for anything. We want you to know that ___________ memory will always be with you and all the lives he/she touched. A memory like that can never be forgotten. A grief like yours can be unbearable and we wish so much for you not to have to endure this pain. Try and stay positive as this pain will pass and you will be able to get on with your life with wonderful pain-free memories of _______________. Please accept our heartfelt condolences for the loss of your ___________. We are thinking of you and pray for your pain to sway quickly so you can concentrate on the memories of such a wonderful person. Suffering is a horrible thing, this is why we share comfort in knowing that _________ is no longer suffering. Although now we see you are suffering with grief. We know there is nothing we can say to bring him/her back, but at least let it be your comfort that he/she is in a good place now and is happy. Deepest sympathies during this time. Keep in mind we are there for you, if you need anything during this devastating time. We are so sorry for your loss and know that our thoughts and prayers are with you and your family. Our hearts go out to you during this time of sorrow. We are so deeply saddened when we hear of this great loss. Although I know that no words can ease the loss you feel, just know that you are in our thoughts and prayers. Words can�t say how sad we feel. We are thinking of you during this time. 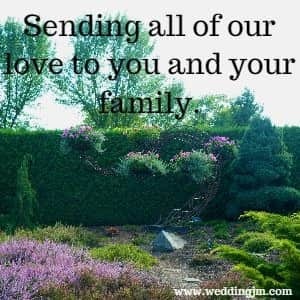 So sorry for your loss and any way we can help, we�d like to be there for you. It is so hard to say goodbye, but know that your love is felt and your words are heard. So take time to say goodbye in your own way. In a time of loss like this, all I can say is how sorry we are and how much we love you. Our sympathies during this time of loss. We can't even pretend to know how you feel, but we can tell you that everything will be okay, you will be okay, time will heal all. I wish I could take the pain you are feeling away. May you know we are thinking of you and hope that brings you some comfort.